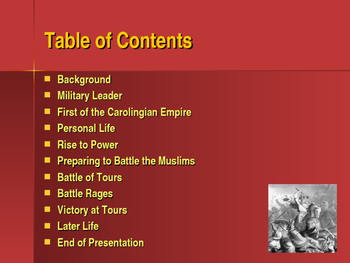 This is a 13 slide, highly animated, power point presentation on The Key Figures of the Middle Ages: Charles Martel. All the slides are editable so you can modify the slides if you need to. 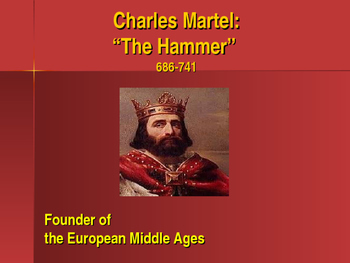 Charles Martel is considered to be the founding figure of the European Middle Ages. Skilled as an administrator and warrior, he is often credited with a seminal role in the development of feudalism and knighthood. 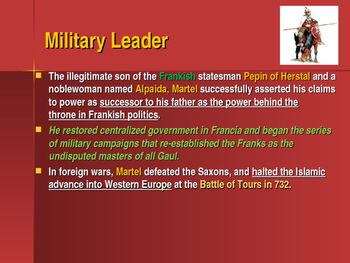 He restored centralized government in Francia and began the series of military campaigns that re-established the Franks as the undisputed masters of all Gaul. In foreign wars, Martel defeated the Saxons, and halted the Islamic advance into Western Europe at the Battle of Tours in 732. 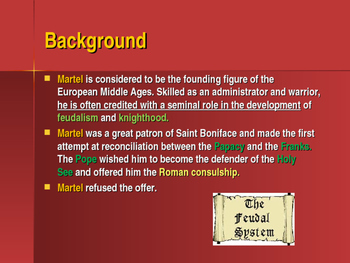 Martel’s victory at the Battle of Tours saved Western Europe from the Muslim invasions and was a turning point in European history.